d a n i e l l e b u r k l e o : faith-isms. 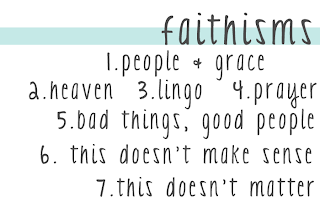 i want to talk about faith-isms here on my blog. what is a faith-ism you ask? i made term up cause that is what i like to do… make up words. 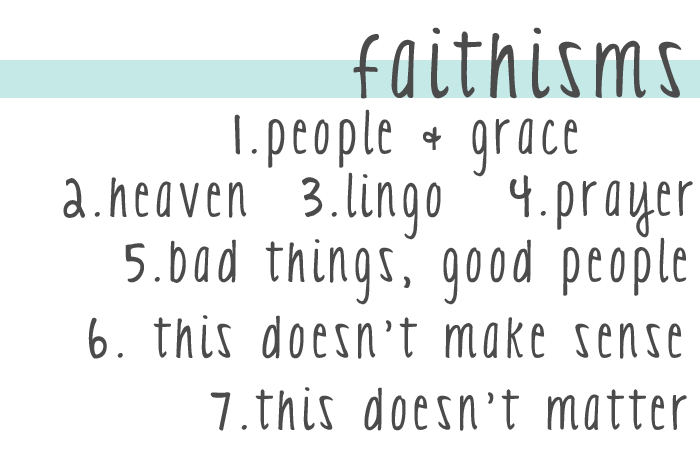 a faith-ism doesn't have an exact definition. it can be something you feel strongly about in your faith/walk with Christ. it can be something that has always been on your heart. it can be something you felt or feel consumed with. it can be something that you have always questioned or struggled with in Christianity. you may have peace with it now or you may not. it can be something you learned that made you have an 'a-ha!' moment that clarified things for you. things that have stuck out in your mind throughout your faith journey. things that have been a integral part of your walk with Christ: good, bad, certain, and uncertain. i made a list of some of mine, and am going to work through them and write about them, throughout the summer. i'd love to hear some of your faith-isms, too. and have some of you share here about what it is that's close to your heart, what you have struggled with, and what you have learned. yours may be similar to mine or completely different. some other things that are floating around my mind are: relationships, the church, control, self image, worship, the bible, grieving, god's will, fellowship, discipleship, i could keep going on... but i'd love hear your thoughts. email me today if you'd like to be a part of this.